Consider what the following description brings to mind. The best Egyptian soccer player of his generation is in a Tel Aviv stadium for the return match in the qualifying stage. The sudden-death rule is in force, so the winner will advance to the most prestigious tournament of all. He scores a goal to help his team win, to the bitter disappointment of the local fans, whose compensation, for what it’s worth, is that they’ve seen a soccer display they’ll long remember. What comes to mind immediately is Mohamed Salah in the uniform of the FC Basel team, playing against Maccabi Tel Aviv in a Champions League game at Jaffa’s Bloomfield Stadium in August 2013. The Egyptian star bumped fists with the Maccabi players instead of shaking hands, to protest the Israeli occupation and as a demonstration of solidarity with the Palestinian people. But even before the star of the Liverpool forward (as he is now) blazed across the local sky, the greatest Egyptian soccer player of all time was widely considered to be Mahmoud Mokhtar, known as “El-Tetsh.” Born in Cairo in 1905, Mokhtar spent his entire career playing for the city’s great Al Ahly club and for the Egyptian national team. After retiring, he coached the team he’d played for and afterward served as head of the Egyptian Olympic Committee. Following his death, in 1965, what was then Cairo’s principal stadium, where he played throughout his career, was named after him. Mokhtar acquired the nickname El-Tetsh – colloquial Egyptian Arabic for an infant taking his first steps – because he was short and liked to jump. We’ll get to his unforgettable performance in Tel Aviv later. In the early 1920s, Egypt, the pulsing heart of the British Mandatory presence in the Middle East and also the hub of the Arab national awakening, was the most advanced country in the region in terms of sports. Its two great athletic clubs, Al Ahly and Qasr El-Neel (today called Zamalek), were founded in 1907 and 1911, respectively; the national soccer team took part in the 1920 Olympic Games in Antwerp; and Egypt’s soccer association was founded in 1921 and admitted to FIFA, the international soccer federation, in 1923. All of Egypt’s neighbors looked up to the team, and especially its neighbor to the northeast. The Zionist courting of Egyptian soccer in the mid-1920s initially scored some achievements, beginning with a visit by the Tzofim (Hebrew Scouts) soccer team and members of the Maccabi club to Alexandria in July 1925. In April 1927, the soccer team of the Alexandria-based Greek sports club played in Tel Aviv and Jerusalem; that November, Jerusalem’s Maccabi Hashmonai reciprocated by traveling to Alexandria and Cairo for matches. To use more contemporary language, those games were feelers. The significant development – the game changer, so to speak – was in May 1929, when the Palestine Football Association, founded the previous August, was accepted into FIFA. The PFA’s admission to the international federation was made possible in large measure by way of Egyptian support, which in turn was won thanks to the good ties between the sports promoter Yosef Yekutieli (who conceived and organized the first Maccabiah, the so-called Jewish Olympics, in 1932) and senior figures of the Egyptian association. FIFA’s recognition opened the door to the advent of closer sporting relations between Cairo and Alexandria, on the Egyptian side, and Jerusalem, Tel Aviv and Haifa, in the Land of Israel. In April 1930, the Palestine team “went down to Egypt” for a series of games that were failures from an athletic point of view, and had even worse results off the field. The team consisted largely of British police and army officers, together with a few players from the local Maccabi clubs. The Hapoel club (affiliated with the Labor movement) and Arab players were excluded. The fact that the team played with a large “P” embroidered on their jerseys only intensified Zionist resentment that the event had been appropriated by the British. Two years later, a Hapoel delegation from Palestine visited Egypt, this time unaccompanied by any sort of scandal. These visits were well publicized, but the movement in the other direction was more frequent and impressive. From 1930 to 1935, clubs, teams and other sports groups from Egypt visited Palestine 18 times (at least). The organizers and hosts were for the most part the PFA or the Maccabi and Hapoel sports federations. In the background, the emergence of the Arab Palestine Sports Federation, which was officially established in September 1932 – though it had been active even earlier – made the situation more complicated: Sports officials in Egypt (and in Lebanon) came under pressure from the APSF to avoid competitions against Jewish clubs, as they were said to undermine the Arab national interest. In response, the visitors from Egypt assiduously organized additional games against Arab teams in Haifa, Jaffa and Jerusalem during their visits to Palestine. This often happened as an immediate reaction by visiting Egyptian teams to criticism by local Arab national activists, particularly by means of popular platforms such as the Arabic-language newspapers Filastin and Al-Difa. Preservation of the delicate national balance was an integral part of the Egyptians’ visits to this country. The first World Cup soccer tournament was held in Uruguay in 1930. Logistical difficulties dissuaded many European teams from participating in the tournament, and so only 13 teams took part, and there was no need for qualifying rounds. By the time of the second world championship, in 1934, things had changed. Italy was to be the host country, and because of the large number of teams that registered, the decision was made in advance to hold qualifying games, with the winners to take part in the final tournament. The qualifying games were organized geographically – the PFA found itself in the African region, alongside Egypt and Turkey. In October 1933, it was decided that the African group’s games would be held in Cairo and Alexandria, during a nine-day period in March 1934. The three teams were slated to play one game against each other, and the team with the best record would then participate in the tournament in Italy. After the order of the games was announced, Turkey withdrew from the competition, its official excuse being that it was in the process of reorganizing its sports bodies. It’s not clear what lay behind the vague statement. In any event, that left just Egypt and Palestine, who would now play two games to decide which of them would take part in the World Cup tournament – based on the total number of goals they racked up. The first game was scheduled for Cairo on March 16, 1934, the second for Tel Aviv on April 6. The PFA had a few months to organize the team; the players were from the Maccabi and Hapoel clubs. The British police and army organized teams for practice matches against the PFA team, and clubs from other countries were invited to visit Palestine for friendly matches to help tune up the team. On March 3, about two weeks before the first game against Egypt, a Romanian team, CFR Timisoara, most of whose players were Hungarian, along with a few Jews, played the PFA team in Tel Aviv. Surprisingly, despite the superior quality of the visitors, the local team won 3-1. On March 9, before heading for Egypt, the Palestine team played a British air force team and scored a 7-2 victory. A feeling of self-confidence in their ability to meet the Egyptians as equals mounted. Ahead of the first game, two delegations set off for Cairo by train, one consisting of the players and the team’s staff, the other of fans. The first match was held on a Friday, in the Cairo stadium. Despite the cautious Zionist optimism, Egypt won by a resounding 7-1. The result accurately reflected the balance of forces between the teams, and made the result of the second, reciprocal game, in Tel Aviv, almost a foregone conclusion. The star of that first game was Mahmud Mokhtar, who scored three goals. Unfounded rumors that spread in Tel Aviv about a Zionist victory were quickly refuted, and at the end of the Sabbath the Hebrew press was left with little to write about, other than to rehash the few compliments about the Jewish team that had appeared in the Egyptian press. Three weeks passed before the Tel Aviv rematch. In this period the PFA team played practice games against a British army team and against a Swiss team that was in Tel Aviv as part a Middle Eastern tour. The Egyptian team arrived in Tel Aviv on April 5, the fifth day of Passover. Ranking Egyptian government officials and representatives of the royal house accompanied the team. The delegation, which included the president of Cairo University and the governor of Cairo, toured Tel Aviv and some of its surrounding Jewish settlements. 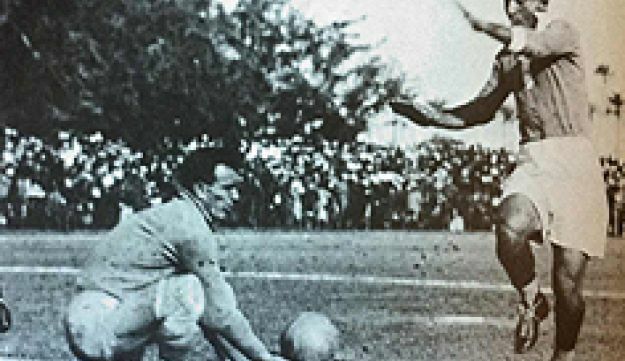 Egypt’s Mokhtar, right, trying to score against goalkeeper Zeev (Willy) Berger and defender Pinhas Fiedler of the Palestine team, at the pre-Cup 1934 game in Tel Aviv. The game was played the next day at the western edge of Tel Aviv’s Florentin neighborhood, on the Hapoel playing field. Egypt won again, 4-1, with Mokhtar dominating the game and scoring two goals. Two famous photographs remain from the game. One shows Mokhtar with the captain of the Palestine team, Gedalyahu Fuchs, from Hapoel Haifa; the other shows the Egyptian star trying to score against the goalkeeper Zeev (Willy) Berger and the defender Pinhas Fiedler. The image of the Egyptian player and his engaging personality symbolized the iconic perception of the foreign players in the eyes of the Tel Aviv audience. The two goals Mokhtar scored in the game were his last for the national team. Three days later, on the Sabbath, a friendly match between the teams ended in a 2-2 tie. In the 1934 World Cup, Egypt was ousted in the first stage after losing to Hungary 4-2. The excitement over the two qualifying matches was keenly felt in the Jewish community – not least because of the historic moment and the proximity, however imaginary, to the World Cup. The games were experienced as an event fraught with a Zionist character. The local team consisted exclusively of Jews, a development made possible by a thaw in the relations between Hapoel and Maccabi. There was no need for British reinforcements; indeed, there was no trace of the British-dominated team that played in Egypt in 1930. Arab press coverage of the two games was not marked by the usual hostility. The leading local papers barely covered the first game, in Cairo. However, the rematch in Tel Aviv generated greater resonance and was reported in a businesslike, descriptive manner, almost entirely without an attempt to promote the typical Arab national agenda. The reports noted, for example, that many Arabs were among the crowd of 6,000 at the Tel Aviv game. In the spring of 1935, Egyptian athletes continued to play against Jewish clubs in Palestine. Despite the tensions that erupted in the Arab Revolt in Palestine (1936-1939), and growing Arab pressure on the Egyptians to put an end to the visits, PFA nevertheless persisted in its efforts to organize visits and sports events with its Egyptian counterparts. The only time the federation drew them to Palestine thereafter was during a six-month period in the midst of World War II, in the spring and summer of 1943. The Egyptian army team played a series of closely scheduled games, in Tel Aviv and Rehovot, in June of that year, after being preceded by a delegation of Egyptian boxers; in August-September the Al Ahly club (reinforced by players from other Egyptian teams) arrived at the invitation of the Beitar Tel Aviv club to play in games in Tel Aviv, Jerusalem and Haifa. The visit violated a ban then in place by both the Egyptian and the Palestine (Jewish) soccer associations, and in its wake both clubs were punished and barred from activity for several months. The coach and head of the Al Ahly delegation was the former player Mahmoud Mokhtar. It was the last time the Zionist and Egyptian teams competed. Mokhtar remembered fondly his visits to Tel Aviv, both as a player and as a coach – at least according to people who spoke with him. In contrast to Mohamed Salah, in the pre-1948 period, the Egyptian commitment to the Palestinian national struggle was less clear-cut. Good, productive relations between Egypt and the Yishuv (the pre-1948 Jewish community in Mandatory Palestine) existed in several arenas, among which sports was one of the most notable. Palestinian and trans-Arab pressure to boycott the Yishuv in the late 1940s thrust the sports officials in Egypt onto a path they did not necessarily wish to embark upon but had to follow. Following Israeli independence, in 1948, the friendly, warm relations between the Yishuv and Egypt were almost completely forgotten, and on the Egyptian side perhaps deliberately played down. After decades in which a particular ethos has been constructed, it’s hard to believe the simple fact, banal at the time, that an Egyptian team celebrated its qualification for the World Cup in Tel Aviv, of all places.